The actor has now gained weight for “Dangal”, in which he plays a wrestler, and weighs 95 kg at present. “I am 95 kg right now and that’s enough for the character. My breathing has changed… when I tie my laces, my stomach comes in between. 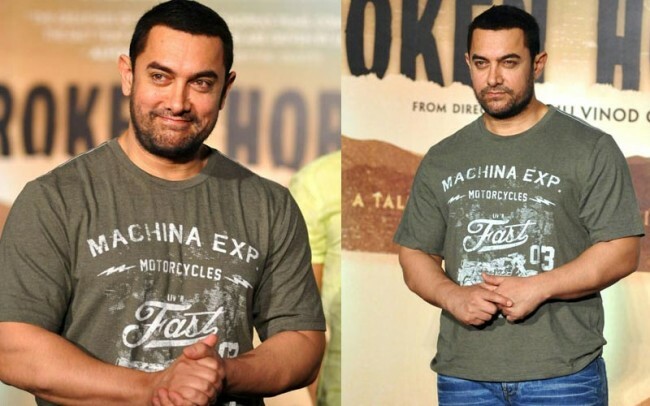 After 20 seconds, I have to (take a long) breath,” Aamir told reporters here. “My mom and my wife are very worried about my health as they feel I am playing with my health. Even I feel the same,” he added. The actor says he will lose weight and will be back in shape once the project is over. “By December (2015), we will finish the shooting, and in the next five months I will lose weight and then have one more schedule in the month of June, where my character is young. When the film will come to an end, I will be back to the ‘PK‘ look,” said the ‘Mr. Perfectionist’, who flaunted eight-pack abs in “Ghajini”.